In the previous post “How to Make Your Computer Easier to Use“, I have described on windows features like Narrator, Audio Description, Magnifier and On-Screen Keyboard. 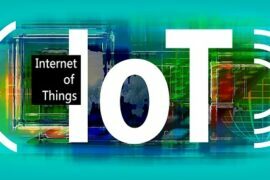 In this post also I am writing about moreover features of window like changing the color and size of mouse pointers, controlling the mouser pointer with keyboard, making the keyboard easier to use, making easier for reading and typing and making touch and tablets easier to use. If you are unable to see regular mouse pointer and the cursor, can change the color and size of mouse pointers which you can see easily. If there is no mouse in your computer, you can move mouse pointer even using keyboards numeric pad. You can make easier to manage windows by activating a window by hovering over it with the mouse, moreover you can prevent windows from being automatically arranged when moved to the edge of screen. Here are the steps for changing the color and size of mouse pointers, controlling the mouser pointer with keyboard and making easier to manage windows. 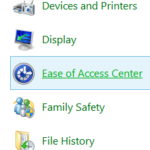 From Ease of Access Center click on the option Make the mouse easier to use. On the mouse pointers option choose the type of mouse pointer which you want to use. To control the mouse with keyboard, give check mark on Turn on Mouse Keys then click on Apply button. Now you can turn on and off using keyboard shortcut keys “leftALT+leftSHIFT+NUM LOCK” and can move the mouse pointer using arrow keys on numeric pad. 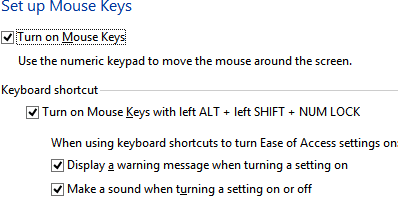 You can enable keyboard short cut keys from Set up Mouse Keys option. Give check mark on the options “Activate a window by hovering over it with the mouse” and “Prevent windows from being automatically arranged when moved to the edge on the screen” to make easier to manage windows. You can make the keyboard easier to type by enabling Sticky keys, Toggle keys and Filter keys. If you are unable to press keyboard shortcut keys like CTRL+ALT+DEL at a time, sticky keys allows you to press one key at a time. By turning on toggle keys, you can hear a tone when you press CAPS LOCK, NUM LOCK, or SCROLL LOCK keys on keyboard. While typing, filter keys ignore or slow down brief or repeated keystrokes and adjust keyboard repeat rates. 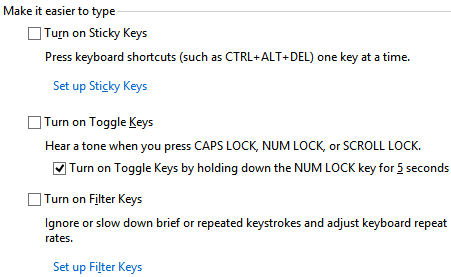 Following are the steps for turning on and adjust settings for Sticky keys, Toggle keys and Filter keys. After opening Ease of Access Center, Click on option “Make the keyboard easier to use”. Give tick mark on “Turn on Sticky Keys” to activate sticky keys, you can activate keyboard shortcut key from set up sticky keys option. Sticky Keys will turned on when SHIFT is pressed five times. Give tick mark on “Turn on Toggle Keys” to activate toggle keys. After activating, you can turn on Toggle keys by holding down the NUM LOCK key for 5 seconds. You can activate filter keys from “Turn on Filter Keys” option. To activate keyboard shortcut key for filter keys open the option “set up filter keys” and turn on keyboard shortcut key for filter keys. Filter keys will be turned on when right SHIFT is pressed for 8 seconds. You can make easier for reading by turning on narrator, which reads aloud any text on the screen and remove background images where available. To make easier to type you can turn on sticky keys, which allows you to press one key at a time while using keyboard shortcut keys, toggle keys to hear a tone when you press CAPS LOCK, NUM LOCK or SCROLL LOCK keys and filter keys to ignore or slow down brief or repeated keystrokes and adjust keyboard repeat rates. You can adjust time limits and flashing visuals by turning off all unnecessary animations and setting up time for notification dialog box. You can lunch common tools like Magnifier, Narrator and On-Screen Keyboard by pressing the windows button and volume up button together on your tablet can start an accessibility tool. You can set which accessibility tool would you like to be launched. To set up this accessibility tool, choose the option “Make touch and tablets easier to use” from Ease of Access Center. Select the accessibility tool which you would like to be launched. 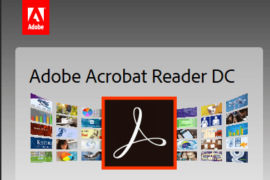 You can get quick access to common accessibility tools like magnifier, Narrator, On-Screen Keyboard and High Contrast directly from Ease of Access Center window. When you click on them, they are automatically started.